You may have heard about Google’s new voice and video chat plugin for Gmail, which lets you use voice and video through the Gmail web interface. You may have also heard that the plugin is standalone (does not require other plugins) or an alternative to using Flash for voice and video chat solutions. Like many, I thought that because Gmail voice and video chat was a plugin, it did not require Flash at all. However, further research showed that this was not the case. Testing whether Flash was required for the Gmail voice and video chat plugin involved a few steps. First, I needed to make sure I was using a browser that did not have a Flash plugin installed. I booted Windows XP, opened Firefox 3, and went to about:plugins. It confirmed that no Flash player of any kind was installed. 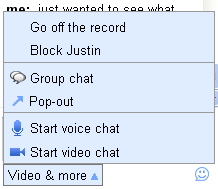 Next, I installed the Gmail voice and video chat plugin. This process completed without any errors or warnings at all and started up Firefox for me when I was finished. Finally, I logged into Gmail and searched for someone that had the plugin installed so I could verify that the plugin was working without Flash. Flash is required to make a call. Click here to install now. So my question was answered: the Gmail voice and video chat plugin requires the Adobe Flash Player. Prior to running the test, I did some searching to find out for myself if the Gmail plugin required Flash. The results were inconclusive. Some people reported vaguely that they had problems but installing Flash fixed them. A news site claimed that “The video chat feature runs on flash [sic]” without providing any supporting evidence. This wasn’t good enough for me, which is why I ran the tests. What bothers me especially about this is not that some sites reported the Flash requirement incorrectly (though that bothers me), but that none of the news sites I found reported that Flash was required. I guess everyone assumes we live in a world where everyone has Flash and that this is a perfectly fine assumption to make. I hope my last post has made it clear that such an assumption is not fine as there are good reasons to avoid Flash. Hopefully this article will finally lay the myth to rest. The Gmail voice and video chat plugin does indeed require Flash. Very interesting, thanks for poking at this. Isn’t a relatively fair assumption that anyone willing to install Google’s proprietary plugin would already have been willing to install Flash? Yes, it is a fair assumption, though having to have 3 plugins installed (the 2 listed above for the Gmail plugin and 1 for the Flash player) in order to use a feature seems a bit overkill. And you’re right, there is nothing intrinsically better about the Gmail plugin than the Flash plugin. Both are proprietary plugins for non-standard technologies. Although I don’t believe you need to agree to a “thou shalt not decompile, redistribute, etc.” license for the Gmail plugin. But that’s probably just because Google’s lawyers aren’t on top of it yet. My post was more about correcting a widely-held fallacious statement, reported by several popular news sites. There are a couple reasons I felt it needed correcting. First of all, news sites should not be able to get away with making blatantly false statements. I find far too often that the “respectable” news sites fail to cite their sources and tend to pull their facts out of the air or, at best, from hastily-drawn conclusions. Meanwhile, less well-known sites like many personal blogs take the time to cite every single source with inline links and they are somehow considered inferior. The second reason I felt a correction needed to be made was that the lack of correct reporting, particularly the lack of any statement from a popular news source that definitively stated the Gmail plugin needed Flash, pointed to a bigger problem. That problem is the reliance Internet users have on Flash. It seems that none of the news reporters had a browser around without Flash installed to test their claim. Why is this? Are we unable to use the Internet without a Flash player? That would certainly be a sad state of affairs. Where has the open Internet gone? Furthermore, I could find no sites saying “I couldn’t install the Gmail plugin because I didn’t have Flash and I don’t want to install Flash”. As The iPhone blog points out, Flash is used a lot for annoying ads. It seems the people who might not use Flash for that reason just grin and bear it when Google tells them they need Flash. People should stop putting up with web sites that tell them they need Flash.